Home | Weight Loss Support | Considering Weight Loss Surgery? Bariatric surgery is making sense to an increasing number of Americans each year - people like you who have resolved to get healthier and maintain a healthy lifestyle. While diet and exercise programs are an important part of any long-term weight management plan, weight loss surgery in San Francisco, Oakland, and other Bay Area communities may be just what you need to start dropping excess pounds. This page discusses weight loss surgery in general and offers links to a few helpful resources. Once you have made the decision to have bariatric surgery and have achieved significant weight loss, plastic surgery procedures are often required to tailor and recontour loose skin and residual pockets of fat. Board-certified plastic surgeon Dr. Thomas McNemar is a specialist in cosmetic techniques serving San Francisco Bay Area weight loss patients who want to enjoy increased comfort and confidence. Researching your options and becoming familiar with the terminology is an important first step on your weight loss journey. There are 2 basic approaches to weight loss surgery. Restrictive procedures like gastric banding (Lap-Band®) decrease food intake, while malabsorptive procedures like gastric bypass create incomplete absorption of food. Both options have advantages and drawbacks. Traditionally, gastric bypass has been the more popular procedure, but gastric banding procedures are growing in popularity due to advances in technology and surgical technique. Once you've done your homework, the next step is to talk with your primary care physician and several bariatric surgeons near you for more specific information about weight loss surgery and professional recommendations based on your situation and desired goals. When you meet with surgeons, be sure to have a list of questions in mind (or better still, written down) that will help you evaluate their qualifications and experience. If you're confused about a surgeon's recommendations, be sure to ask additional questions for clarification. Choosing a bariatric surgeon is a difficult process, but one that is vital to your happiness with your weight loss surgery experience. Keep in mind that weight loss surgery is major surgery and all decisions related to your bariatric procedure need to be taken seriously. With proper care and long-term commitment to changing unhealthy behaviors, you can enjoy increased mobility, enhanced self-image, and improved quality of life. 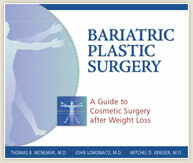 To help you learn more about weight loss surgery options, here are a few other Web sites with useful information. Please keep in mind that these links will take you outside of our Web site to destinations we do not control, and while they have become trusted Web resources, we cannot ensure the accuracy of any information on these sites. Dr. McNemar takes an interest in helping men and women find a lasting way to maintain a healthy weight and look their very best. He works closely with San Francisco, Oakland, and Bay Area bariatric surgeons and weight loss specialists whose patients need post weight loss body contouring. If you are just getting started on your weight loss journey, he is happy to help point you in the right direction. Just call (925) 866-0177 for our San Ramon office or (209) 834-0626 for our Tracy office, or you can contact us online for more information.